Coral have an offer this weekend which unfortunately is only for new accounts. But if you have been thinking about opening a Coral account today is the day to do it. Man City are currently a best price 3/4 to beat Spurs at home on Sunday. Coral new account openers can get 5/2 on Man City. Unfortunately you can only stake a max of £20 on this offer. Coral are also best odds on today's free football bet, so if you don't yet have a Coral account you will get the value there as well if you sign up today. We had a profit from the football bets last week, but it's been a while since we've had a full house and hit the jackpot. Hopefully this week. Don't forget you can get all the TAPS football tips and all their daily racing tips on a one month free trial – Click Here. I've noticed some of our emails are getting delayed at the moment, I don't know if this is a holiday season thing, but just to let you know that the post goes live on the website by 11:00 am each day, so if you don't receive your email then you can just come back to the Daily Punt site and the days post will be there. Today we have a football bet and a racing selection. It used to be that bookmakers were the only option if you wanted a bet, they had a monopoly and were very aware of that and acted accordingly. IE big over rounds, restricting accounts etc. Then along came betting exchanges and we had choices. There was a period when there seemed to be no point having any bookmaker accounts because Betfair always seemed the better option. But that is not necessarily the case now. In fact I would go as far as to say that if you want to win on the horses then bookmakers Best Odds Guaranteed is a key weapon in your armoury. There are many people that will tell you that the Betfair price at the off is a true representation of the horses chance of winning. If that is the case then it follows that you cannot get value at the off. This is because the Betfair price is true odds plus their small over-round (circa 1%) and the on course bookmaker price is invariably shorter so how can you get value. The value is in the early prices and the shrewd punter identifies where that value is and gets on with a Best Odds Guaranteed bookmaker. 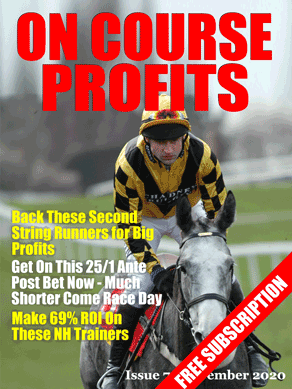 The other reason to use bookmakers as opposed to Betfair is for the bonuses that they offer for new accounts. You can literally make a thousand pounds just by taking advantage of bookmaker offers – To take full advantage of these offers use a guide like Bonus Bagging (Click Here). These guys will do all the hard work for you and send you an email telling you exactly what bet to place, at what stake and who with to get your free money.